First show of the Hero I-League season in the fortress- full of pomp and piety, the football lovers of the Garden City filled Sree Kanteerava Stadium in good numbers. With Kolkata derby ending on a stalemate, Bengaluru FC’s 3-0 win today against Shillong Lajong FC ensured top position in the points table. Shillong Lajong started the game from left to right. Before the spectators actually settled down, the hosts took the lead. 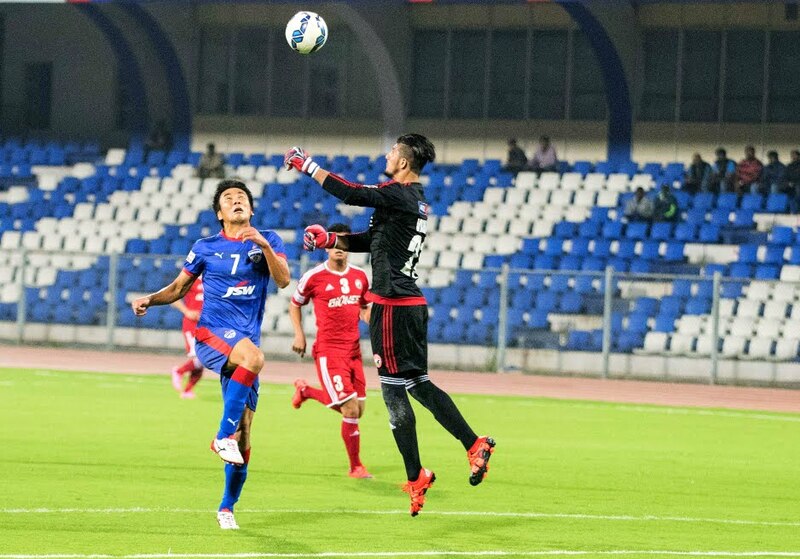 An error from the Lajong defense, enabled Bengaluru striker Vineet, carrying out the new striker role in perfection, pick a loose ball, and banged diagonally to the goal, out of keeper Vishal Kaith’s reach. The match, just 37 seconds old, was the fastest goal of this season, arguably coming next to James Moga’s 14 second goal, which he scored for Pune FC against United Sikkim in the 2012-13 season. Shillong Lajong is perhaps the youngest team in Hero I-League. The Brazilian striking duo for Lajong Uilliams and Fabio Pena, with poor touches barely proved any threat to Bengaluru. CK Vineeth was again in action, assisting the second goal for Bengaluru FC in the 35th minute. Cutting in, Vineeth provides a square pass to Eugenson Lyngdoh, which the keeper fends off, following up, partner Kim Song Yong puts the ball back of the net. Changing ends, Shillong Lajong started in a positive note. They forced a corner in the second minute followed by a set-piece in goal scoring vicinity, none offering any joy to the Lajong fans. Kim added another to his tally in 60th minute - a perfect thru ball from the right flank, he split Lajong defense, and slots to home. He could have been a worthy owner of hat-trick should his powerful low strike seen the back of the net instead of goal post. It was Kim Song Youg who bagged the Hero of the Match award.